Johnson's Cuba Jamaica and Porto Rico. 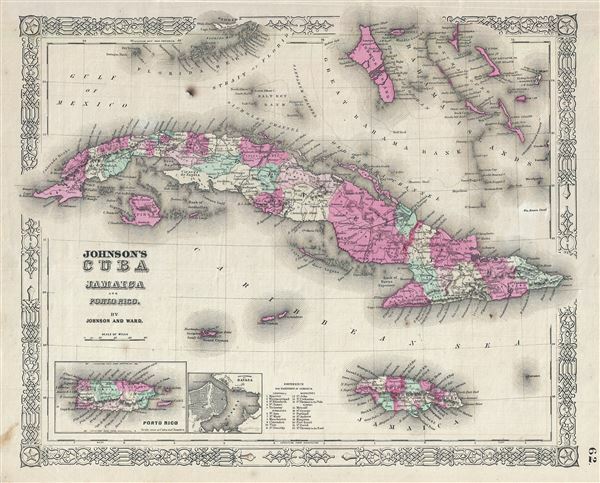 This is a beautiful example of Johnson and Ward's 1863 map of Cuba, Jamaica, the Bahamas and Puerto Rico. Also shows part of the Florida Keys. The map offers superb detail of the entire region including roadways, cities, provinces, and undersea dangers. Two insets in the lower left detail Porto Rico and the City and Harbor of Havana, Cuba. Features the fretwork style border common to Johnson's atlas work from 1863 to 1869. Published by Johnson and Ward as plate no. 62 in the scarce 1863 edition of Johnson's Family Atlas. Very good. Minor overall toning. Text on verso. Minor spotting. Rumsey 2905.034 (1860 edition). Phillips (Atlases) 6140, 51.